What Is a Bed-In-A-Box, and Is It Right for You? When it comes time for a new mattress the choices can be overwhelming. There are countless models and types to choose from and consumers can get confused about what they really need. This is where bed-in-a-box can make the decision easier. A bed-in-a-box is just a foam mattress that has been folded tight enough to fit in a box. They are found at online retailers and have been growing in popularity over the last few years. Even with a boxed-bed option, there is still a wide range of options when it comes to selecting a mattress to fit your needs. The majority of the mattresses are foam but there are some styles that incorporate innerspring and adjustable air mattresses too. While the popularity of ordering a mattress online has still to take off in a big way, trade publication Furniture Today found there has been a six percent increase in the number of mattress companies that offer direct-to-consumer sales, and now makes up around 12 percent of the total mattress market. It has been estimated that other mattress retailers have lost about 30 percent of consumers to online bed-in-a-box manufacturers. In an effort to further boost sales, some companies that sell boxed beds offer free shipping to customers. They also offer long trial periods and flexible return policies. Consumer Reports estimates there are now 200 boxed-bed companies. Here are some of the benefits and drawbacks of boxed-beds for consumers. The biggest benefit of a bed-in-a-box mattress is the convenience of delivery. These boxed mattresses are folded up, wrapped in plastic, and shipped in reasonably-sized boxes. They usually arrive within a week. One of the drawbacks is that although they are compact, the boxes are usually too heavy for one person to carry on their own. To help customers with this problem, some companies offer extra services such as a full set-up, and some charge a fee for this. They may even remove and discard your old mattress for you. Remember that it can take several hours for the compressed mattress to regain its proper shape. Manufacturers advise you not to sleep on the mattress until it has uncompressed completely. Another major con of boxed mattresses is the inability to get a good comparison. Online retailers sell just one type of mattress in a one-size-fits-all approach. In some locations, retailers have opened up a try-before-you-buy opportunity that allows customers to see the mattress in person before ordering online. As proof that these mattresses are competitive in the market, after testing about 41 different boxed mattress types Consumer Reports gives bed-in-a-box mattresses very good or excellent ratings. “Many of these foam mattresses perform really well and hold top spots in our ratings, which include traditional mattresses,” Consumer Reports mattress expert Chris Regan told CTV News. Statistics also show that just seven percent of bed-in-a-box mattresses are returned. 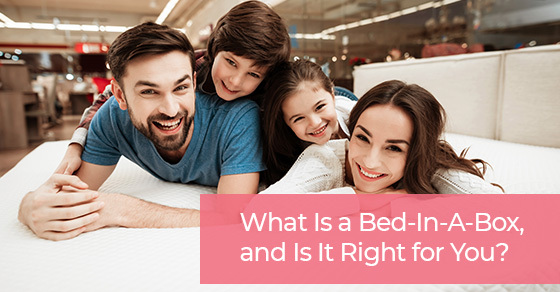 Along with a generous trial and return policy, boxed bed companies even help customers find a place to put their mattress if they decide the product is not right for them. This may include picking it up, locating junk removals, or a place to donate it. Box spring or no box spring? When it comes to whether or not you need to have a box spring when you buy a boxed mattress, there is no right or wrong answer. Some professionals advise that the foam mattress is strong enough by itself, while others suggest the extra support of a box spring is best. Some online retailers offer box springs that can be used with boxed mattresses. Others suggest that their mattress will work with any type of box spring support. It has been recommended that customers follow the manufacturer’s recommendation, if only because not doing so will void the warranty and any chance of a refund. The beginning of Bed-in-a-Box era dates back to 2007 when Bill Bradley, a machinist based in Tennessee, developed a machine that could fold foam mattresses small enough to get them into a box. While he never made it big, other companies have copied his model and have been changing the way consumers buy mattresses. Professionals recommend replacing your mattress every seven to ten years. If you are considering getting a new mattress, a bed-in-a-box may be the right fit. These mattresses provide the convenience of online shopping and delivery along with a well-tested product that can help you get a good night’s sleep. Sales of online boxed mattresses have been increasing as more and more people become aware of the option. Most models have earned a very good or excellent rating, which proves they are a competitive alternative to traditional mattresses. Yet, many bed-in-a-box retailers are still offering bonuses such as free delivery, extended trial periods, and flexible return options to entice customers to give it a try. If you are looking for a convenient place to order your bed in a box, Toronto’s Mattressville sells a variety of brands including Galaxy, Springwall, Mlily, and Eco-Fusion at prices from $168 up to $3,000. For more information about the bed-in-a-box, call Mattressville at 905-212-7722 or contact us contact us here.